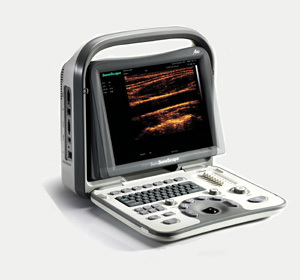 The SonoScape A16 ultrasound is often rated as one of the best imaging black and white portable ultrasound machines, and it packs exceptional imaging and performance technology into an ultra-portable, laptop-sized package. Weighing just 13 pounds and with a 12-inch LCD screen that tilts up to a 30-degree angle, the SonoScape A6 is versatile and available for both human and veterinarian applications (which may depend on the transducer you use). Additionally, when bringing the SonoScape A6 ultrasound on-the-go, you’ll be able to enjoy extended usage with its 3-hour battery, 1G of internal flash storage, networking and DICOM capabilities, and export possibility via USB or DVD-R. This is a very nice black and white portable ultrasound system. Its price point is among its most attractive features, as it’s available new with a 2-year warranty. The image quality is among the best in its class, which makes it a great solution for those looking to place PICC lines, perform MSK work, general abdominal and general OB imaging. Call today to get a free quote!